Park City Film Director, Katy Wang said they are bringing the Film, Bias to town because it ties in with the social equity initiatives in Park City. She hopes the film will inspire the people watching it to pay attention to their own built in intolerance and prejudicial tendencies. “We’re really excited to have Robin back here in our community. We really feel like this film taps into the local conversations we’re having about social equity and how we as a community can really start engaging in those conversations. The film will be followed by a panel discussion, which of course Robin will be on. We’ll also have Dr. Marco Barker who is Westminster’s VP for Diversity, Equity and Inclusion. Sadie Ortiz who is a high school student and part of Latinos in Action and Teen Council. And, then Megan Zarnetsky who is social justice teacher at Treasure Mountain Junior High and she’ll be the moderator. So, really engaging. We don’t want to show you the film and leave you with your own thoughts. We really want to get you to dig into it and unpack all the great ideas that are in this film." Director, Robin Hauser said if you have a brain, you have bias. She’s learned a lot from her prior film that studied the gender gap. Hauser said people don’t have the ability to see bias in themselves. Hauser said when humans lived in tribes, it might have served our ancestors to have inherent bias to protect themselves. She said it isn’t serving society or individuals well any longer. The experts in the film use a test that reveals biases and Hauser said she found it disturbing. Hauser is a self-proclaimed feminist and she explains how surprised she was when she took the Implicit Association Test on the topic of Gender/Career. 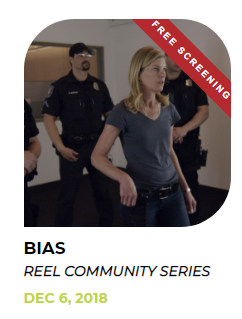 The film, Bias will screen at the Jim Santy on December 6th at 7 pm. It’s free and there will be a panel discussion immediately following the show. On today’s program, Director of Summit Land Conservancy Cheryl Fox discusses open space issues. Summit County Sheriff Justin Martinez talks about his budget requests, including two new patrol officers. We also discuss his commitment to residents for the next four years of his new term and Park City Film Series Director Katy Wang talks about the change in the organization’s name as well as a new initiative at the film series for low income residents. Katy Wang, the Executive Director of the Park City Film Series, joins the show. On Thursday, September 27, the Film Series will screen the film, "The Most Unknown," a film that has scientists from various disciplines explaining their work to each other. It is part of their STEM educational series. A panel made up of scientists and science educators will meet after the screening to talk about how to get kids excited about science. KPCW host Rick Brough is joined by the self-proclaimed Rick's Flick Chicks Barb Bretz, Katy Wang, and Linda Jager to review summer movie experiences, Sundance films playing in Park City, and Oscar talk. On today’s program, Summit County Lieutenant Justin Hemingway and Park City School District Associate Superintendent of Wellness Ben Belnap talk about Front Line, Blue Line – an event taking place on September 10th at PCHS. This is an opportunity for parents to learn more about how to keep kids safe , identify risky behaviors and what to do about it. On today’s program, Park City Chamber Bureau newly installed President Jeff Ward and Marketing Director Jim Powell discuss the change in leadership and next winter's marketing plan. New manager of Mountain Regional Water District Scott Morrison talks about his new job managing one of the county’s largest water systems. Park City Film Series Director Katy Wang and Producer of the International Ocean Film Tour Henry Lystad have details on the 3rd Annual Drive-In movie experience on Saturday.